Over the past two weeks I've immersed myself in the ten-fragrance Derek Lam 10 Crosby collection, so this week I'm treating myself to a springtime rose fragrance by one of my favorite niche houses — to cleanse my palate, if you will. 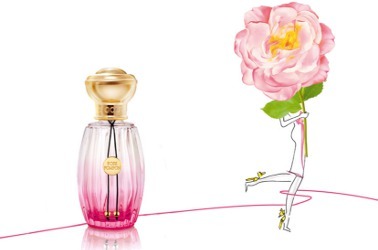 Annick Goutal's new Rose Pompon was developed by Camille Goutal with perfumer Philippine Courtière, and is designed to evoke a "young Parisian woman" who "exudes joie de vivre." Its notes include Bulgarian rose, taïf rose, peony, black currant, raspberry, pink pepper, cedar, patchouli and white musk. I like Rose Pompon, although it doesn't feel like much of a rose perfume on my skin: I get mostly black currant and sheer musk with some peony and pink pepper. It has a nice balance of tartness and sweetness, and it's sheer and fresh in way that feels very contemporary and makes it a good fit for the younger Goutal customer. It has surprisingly good tenacity for an Eau de Toilette. 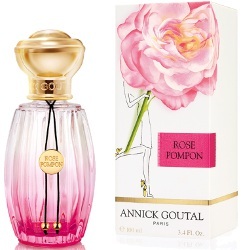 Annick Goutal Rose Pompon is available in 50 ($105) and 100 ml ($149) Eau de Toilette. For purchasing information, see the listing for Annick Goutal under Perfume Houses. I can’t say Rose Pompon sounds exciting, but I’m glad to hear it’s not offensive. But now that I’m reminded of Eau de Charlotte I miss it! I may have to track some down. I think I swapped mine away because it started to bore me, but now I remember it fondly and I’m craving it. I occasionally wish I owned a decant…it’s very unusual, in its sweet little way. minteacup, where are you located? I have an extra small bottle (.83oz, maybe) of eau de Charlotte from a set that I would be willing to swap! Ooh! Hopefully I have some fragrances that would be of interest to you. Assuming that I’m in the right country, that is: I’m in the continental US. Send me an email at chez.kline at verizon dot net and we can work something out! The bottle looks so pretty, but the gateway to AG fragrances in my very humble peasant girl from Brooklyn opinion would not be this- because I think young ladies have smelled this theme already- but Eau d’Hadrien, which is so crisp and pretty and can be worn by a young lady or her boyfriend! I’m always happy when Goutal continues to carry on and make new fragrances. I would be very interested to test this, but my fav of the light and frivolous Goutal roses is Rose Splendide. And I still need to test the Ile de The from the other year! After Quel Amour!, Rose Absolue is my favorite. I really should own a bottle someday…but yes, they do a good job with roses, generally! Has Isabelle Doyen left Goutal? The fragrance sounds very much in the vein of what Goutal has recently been turning out; nice enough, but not that interesting. I don’t know; I wonder! It does fit in well with Vent de Folie. I prefer the older ones, but if these newer concoctions help to keep the older ones in circulation, then I’m happy! That’s a great approach, and you are absolutely right of course. Sometimes I’m able to take this philosophical stance. Not always, but sometimes. I don’t think anyone who loves Mon Parfum Cheri par Camille will love this one — MPCPC is so old-school and lush and operatic, and this one is youthful and breezy! I was tempted to blind buy Rose Pompon based on my love of AG, rose, and the adorable marketing. Glad I held off, after reading this review. Sounds pretty, but not like a must-have. Instead, I finally bought the bottle of Rose Absolue from Fragrancenet that I’ve been wanting since I tried it last summer (I bought Ce Soir ou Jamais that day). Ce Soir ou Jamais is my fav deepest rose from Goutal. Oh, that’s another nice one. No wonder Goutal was one of my entry-points into niche perfumery — so many good roses! I kept reading this as Rose Pompom and looking for pink fuzzy balls! I won’t seek it out but will try it when I see it. P, do make a visit to the Annick Goutal boutique on Bleecker Street if you have an opportunity — it’s *so* pretty and I really enjoyed my visit. A young woman named Taylor assisted me and she was lovely. On another AG matter, i am really tempted to blind buy Heure Exquise from ebay, as it seems to be discontinued in the uk. I’ve read, and been warned that it’s very soft tho, and i have scent eating skin, do u think it’s very soft, do u love it, or like it?- i love no 19, so maybe i should try edp of that beauty instead.. first world problems ay?! Thank u! Oh, you know, I said “soft” the other day, but I mean in feeling, not in strength. HE lasts well on me and has moderate sillage. Oh good to know, thanks mals. I love Heure Exquise, especially the EdP — although I’ve had my bottle for a while and I don’t know whether it’s been reformulated at any recent point. I think it has a nice amount of body and depth! Thank you, i think i will bite the bullet in the spring. Ah, I like that bottle! I was eventually able to convince myself that I liked Nuit Etoilee enough to acquire that beautiful blue bottle, and I can see the same might also happen with Rose Pompon. Gah, they do some really beautiful special bottles, don’t they?! I don’t get it. First they have clear bottles, then they introduce colored bottles for new scents, then they repackage everything in clear bottles again, now they have a new one in color…. I’m wondering whether it has to do with the changes in ownership?